Hard water can be quite the nuisance. Not only does it make showering, washing dishes and doing laundry a hassle, it can also wreak havoc on your plumbing and appliances over time! If your house draws from a hard water source, you are probably looking at ways to soften your water supply. The best way is to use a whole-house water softener, so every faucet in your home will supply clean, softened water. 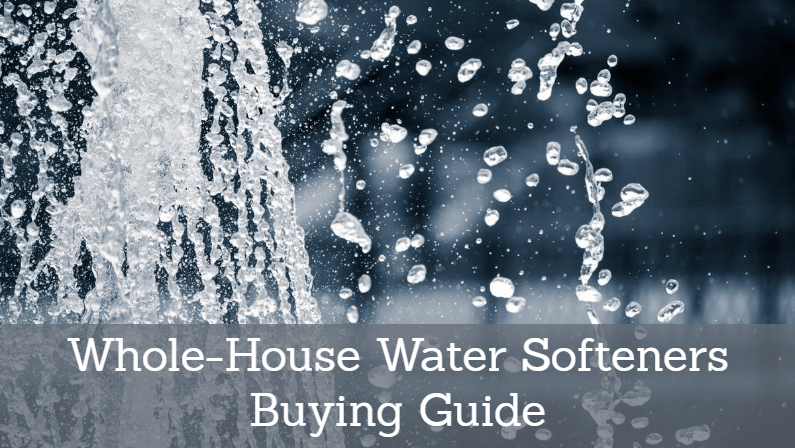 The guide below will help you find the best whole house water softener for your needs & budget. These recommendations are made based on a combination of our own testing and research, manufacturer specifications, and third-party whole house water softener reviews. The Fleck 5600SXT is our pick for the best whole house water softener 2019. It actually tops our list of the best water softeners in general! This unit is made for households of up to 6 people, and can maintain a flow rate of up to 12 gallons per minute. That’s enough to supply multiple faucets and showers at once. This unit has a high grain count of 48,000, which makes it effective at softening even the hardest water sources. It’s also a very low-maintenance unit, with a meter-based regeneration cycle that cleans the filtering resin regularly. The Fleck also features an advanced digital valve with an LCD display to help you monitor water consumption, and the current status of the softener. The display can also show error codes should something go wrong, which you can look up in the user’s manual to fix any issues. In short, this is a high-performance, high-capacity water softening system that’s equipped for whole-house use. It works exceptionally well, earns great ratings in whole house water filter reviews, and is easy to operate and maintain. See our full Fleck 5600SXT review for more information. 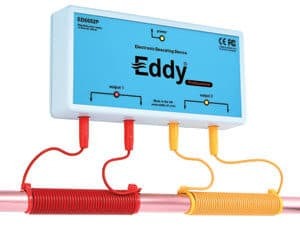 The Eddy Water Descaler is similar to a water softener, but it uses a different process. It’s an electronic water descaler, which uses a electrical charge to stop minerals from sticking to appliances and piping. It doesn’t actually remove any minerals, but instead protects your appliances by preventing limescale buildup. It’s a salt-free setup, so it’s far more environmentally friendly than traditional water softeners – and it uses very little electricity to function. Depending on your needs, this unit may or may not suit you. If you are looking to protect your plumbing and appliances in a budget-friendly way, this is a good option. But if you want to actually remove minerals from your water (to help actually soften the water), you’ll have to go for a more pricey option. 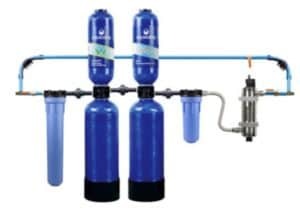 The Aquasana EQ is a high-end whole-house filtration system. 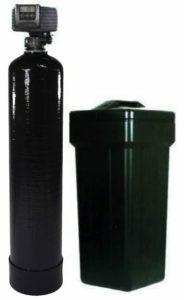 It includes both a water filter (designed to remove chlorine and contaminants), and a water softener (designed to reduce mineral content to soften water). There’s even an optional UV light filter to kill bacteria! So, while most water softeners solely work to soften water, this unit improves your water in a number of ways, and supplies clean, chlorine-free drinking water to your family. The Aquasana is more pricey than most, and certainly takes up more space. However, it does more jobs than your average water softener. If you want both softened water for cleaning and showering and filtered drinking water, this all-in-one option is a great choice. Aquasana reviews are almost always very positive as these units perform at the highest level. The Rhino is also available on Amazon. Longer Appliance Lifespan – mineral deposits from hard water can start to build up in appliances like water heaters, dishwashers and washing machines. This can potentially damage the appliances, and typically shortens their lifespan. Considering the high cost of replacing appliances, protecting your investment with a water softener may be a good idea. Cleaner Faucets & Showers – mineral deposits can also build up on water faucets, shower walls, and more – causing unsightly gunk to accumulate that’s difficult to remove. Water softeners help reduce the mineral concentrations in your water, further reducing these ugly buildups. Softer Skin & Clothes – hard water can contribute to dry skin, and can also cause clothes to come out of the laundry feeling rough and scratchy. Water softeners help to reduce these trends, resulting in softer skin and hair, and softer laundry. Interestingly, water softeners can also help you use less soap and detergent. Many soaps and detergents simply don’t lather very well in hard water, which sometimes means you need to use significantly more cleaning products to do the same job! Test Your Water – you can purchase an at-home water test kit to test your water’s hardness rating. You may also be able to use a water bottle with some soap to get a rough idea of hard mineral content in your tap water. Check for Visible Signs – hard water often causes visible stains on sinks, showers, toilets and other areas where water comes in contact with hard surfaces. These stains are usually a white/gray buildup of minerals, and they can be difficult to remove. If you have this type of stain, chances are you have hard water. Consider Your Area – some areas are much more prone to hard water than others. You can check this hard water map from the USGS to get an idea of typical water hardness in your area. Capacity & Flow Rate: Since these are whole-house units, the capacity, grain count and flow rate of each unit is very important. The best whole house water softener should be able to easily supply a whole house (with multiple bathrooms) with softened water. Softening Technology: We focused on systems with advanced water softening technology, for the best results. Typically salt and resin based setups are the most effective, while electric descalers provide a cheaper alternative. Reviews: We focused on our own research and testing, but also analyzed lots of whole house water softener reviews from other customers. This helped us understand how well each unit worked with a variety of water sources. Durability: We understand that these systems are not cheap, so we wanted to recommend units that were well made and durable. You want your investment to last a long time – starting with a high-quality model might cost more, but it’s worthwhile in the long run.